Trade unions must embark on wide-ranging reforms including considering plans to sell services for a fee if they are to climb the “mountain” of falling membership and an apparent irrelevance to young people, according to a new report. 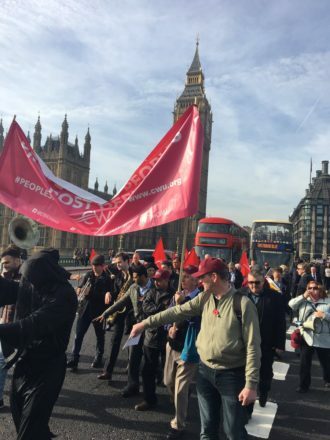 The labour movement should embrace innovations such as an “instant breakdown cover” model for workers with an existing employment problem, and use the TUC as a “clearing house” to help people find the right union, it said. The recommendations are part of a blunt report from the Changing Work Centre, a joint initiative by the Community union and the Fabian Society, which is chaired by Yvette Cooper, head of the home affairs select committee. The study aims to halt 40 years of declining union membership and comes after a period of intense change under the Tories, in which swingeing cuts have resulted in the loss of around one million public sector jobs while David Cameron introduced new curbs on industrial action and the rise of the gig economy has prompted more people to switch from employment to acting as “contractors”. There are also reasons for optimism, however, as the research found that three in five private sector workers believe that trade unions are necessary to protect working conditions. Today the Changing Work Centre sets out an 11-point plan for renewal following months of interviews with leading trade unionists. Innovations, such as the provision of “instant breakdown cover” for workers with a pre-existing employment problem, changes to membership rate structures, and the development of new tools and apps to organise disparate workers. A new clearing house role for the TUC, 150 years after it was set up. Measures to tackle a “diversity deficits” in unions’ leadership teams. The establishment of career development centres so unions can help workers prepare for their future. “This report is a welcome reminder of the huge challenges facing trade unions today. Doing nothing clearly is not an option, and we will be looking closely at the report’s recommendations to understand how best Community can continue to adapt to the changing world of work,” said Roy Rickhuss, general secretary of Community. “With the self-employed sector soon to be bigger than the public sector, unions must be ready to meet the needs of millions of non-unionised workers. Community’s Indycube project is already helping tackle this problem by ending late payments and providing instant, free legal assistance for self-employed workers.